We all know that the pros play with frames that are different than the consumer versions. Let's take a look at the real story of the frame of one of the most accomplished players in tennis history -- Rafael Nadal. 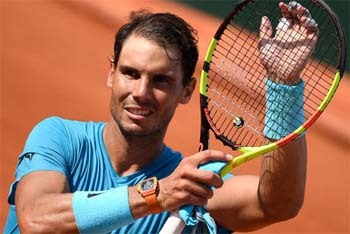 Then let's talk about his strings and what it's like to actually string for Rafa from the viewpoint of Joshua Newton, an old friend who led the Babolat stringing team at the 2018 French Open. Rafa won Roland Garros this year using a Babolat Pure Aero La Decima French Open. But it was a customized, special frame. So what were the modifications? What makes it so quick, so stable, and so lethal? The Babolat spec sheet says frame weighs 317 grams unstrung, or 11.3 ounces. That's light—very light—a good weight for club players but too light for a pro. A.J. Chabria, has played, covered, and coached at circuit events all around the globe. After working for over 25 years as Head Pro and Tennis Director at historic clubs in Marin County and Dallas, he now coaches elite players and customizes frames for college, tour and club players. He also serves as a teacher and tester for the USRSA's Master Racquet Technician program. A board member of the Texas division of the USPTA, he is the liaison to the national office of the USPTA Foundation. He is the proud owner of a family vintage racquet collection which goes back three generations dating to 1905.